This Neokolla leafhopper was found feeding on developing seed pods of Desert Willow (Chilopsis linearis) near Camp Creek, Maricopa Co., Arizona on 13 Sept. 2008. 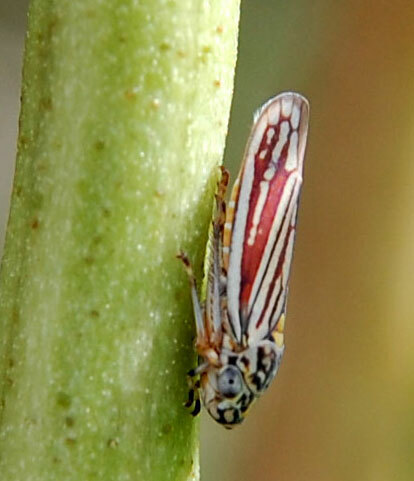 Leafhoppers are normally quite small insects. The adult specimen at left is less than 5 mm in length and as such is one of the larger species. The magic of macrophotography lets us get a close-up look at these often colorful and fascinating creatures. This one is sometimes common on Desert Willow, a relative of the catalpa tree. According to Dr. Andy Hamilton, this is an apparently undescribed species. As yet a specialist still needs to describe it properly and publish the results in a scientific journal. Only then will this element of the Sonoran Desert biodiversity have a name to which behavioral and ecological observations about it can be pinned and collated. How does this tiny cog fit into the ecology of the Sonoran Desert? There is so much to explore and learn just beyond the ever-expanding boundaries of our desert cities.